After choosing to spend the rest of our lives together, to celebrate our love and commitment to one another in a destination far from home in one of our favourite places, the Mayan Riviera, one of the most important decisions we had to make in regards to our wedding was choosing a wedding photographer. We wanted a photographer who would not only capture all the events of the day, but also all of the emotions that went along with it. Our wedding planner sent us several photographers to choose from. Genya and Erik’s unique style and ability to convey so much love, emotion, and beauty in all of their photographs made them the clear choice. We fell in love with their style, their use of light, and the fact that none of their photos ever felt staged or posed. We did not have a “cookie-cutter” wedding and did not want posed, generic wedding photos. 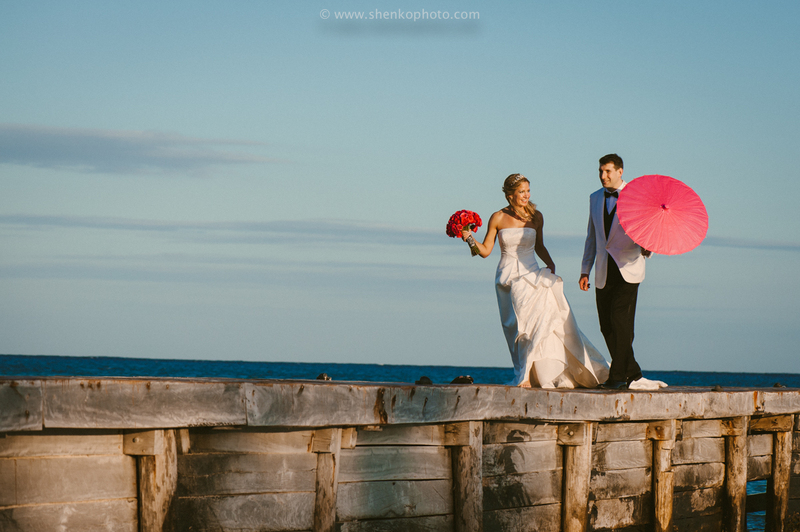 Genya and Erik of Shenko Photography felt like the perfect compliment to our unique style from the very beginning. Upon meeting Genya at our resort for our pre-wedding photo session, we instantly knew we had made the right choice. Genya was sweet, welcoming, and funny. She made us feel so comfortable.. As she was taking our photos around the resort we got a really great idea of how she works and it did not take us long at all to feel comfortable and natural in front of her camera. It was so wonderful to get to know her before our wedding day, and it made our experience with her that much more enjoyable. Our experience with our photographers on our wedding day was even more enjoyable, fun, and comfortable than it had been two days earlier on the resort. We did not even notice their presence during the ceremony and reception, which seems incredible now since they were able to capture so many amazing shots. 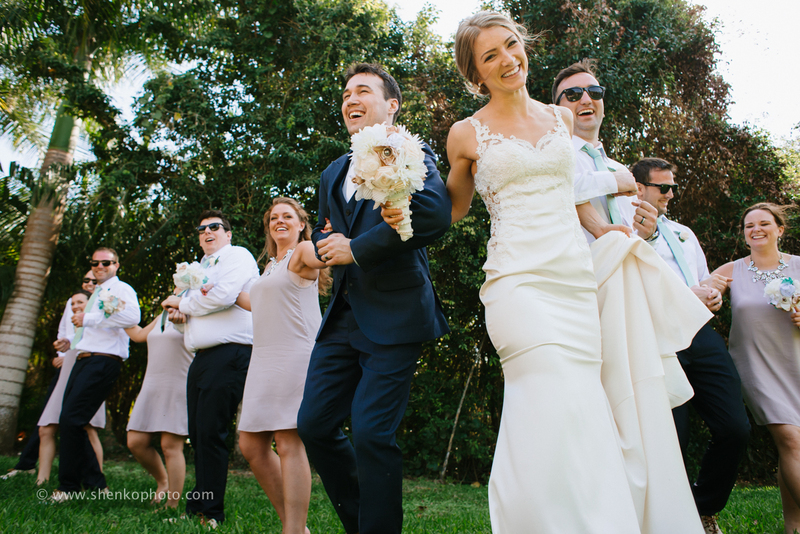 Our photo session after the ceremony felt like such a fairy tale and Genya was great at moving everyone along and making us, our wedding party, and all of our guests really enjoy the entire experience. We are so happy with our wedding photographs. They are exactly what we had hoped for. They are dreamy, whimsical, and truly capture the love we share for one another. They captured the fun and spontaneity which encapsulated the entirety of our wedding day. They are memories and emotions which we are able to hold on to and treasure in the many decades to come. 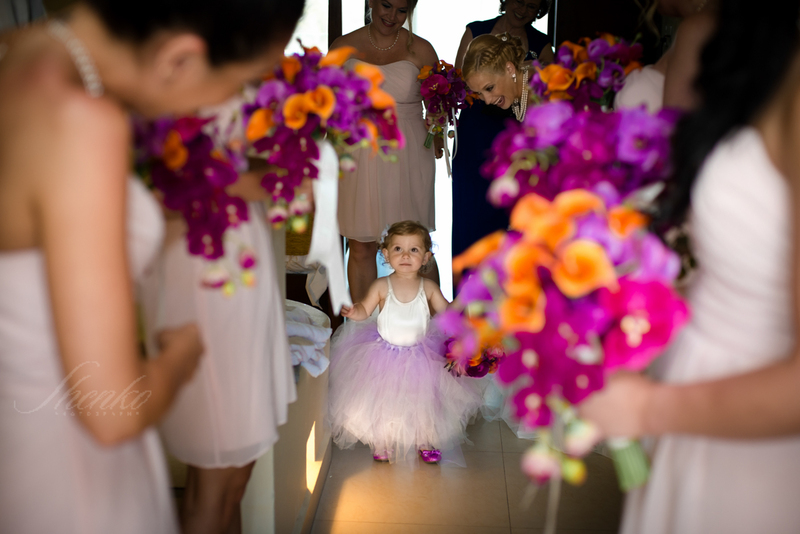 Working with Genya and Erik was one of the best parts of our wedding! There are so many reasons we would highly recommend them: We loved working with a husband and wife team, rather than a photographer and assistant – it was such a great vibe. Genya and Erik were very friendly, reliable, and flexible. We planned several sessions and they were always prompt and communicative, and we were able to alter some plans as things shifted during our time in Mexico. For folks interested in an underwater cenote session, Genya’s and Erik’s pictures are a “cut above” the rest (we surmise this stems from Erik’s diving background). Our underwater photos have blown people away. And on top of that, Genya and Erik did an amazing job on our photos in general. In addition to the underwater session (which we did after the wedding), we did a pre-wedding session on the beach that produced some of our favorite pictures and of course the wedding and reception itself. We were just getting some of our favorites blown-up and the folks doing the enlargements shared that they “loved, loved, loved” the photos. We couldn’t have said it better ourselves. Thank you Genya and Erik for helping us preserve so many vibrant memories from our wedding weekend! When we decided to plan for a destination wedding we had heard from a lot of people its sometimes better to find someone outside of the resort. We started searching and came across Shenko Photograpty and fell in love with their style and knew we had to hire them to capture our big day. We first met this couple a day before our wedding for a pre-wedding day photo session. Eriк and Genya were very enthusiastic and easy going which worked perfectly for us. They helped us to become more comfortable in front the the camera and also helped us to iron out some details that our wedding planner had not even thought to do! As a couple my husband and I were a little awkward when trying to get the right shot. It was great to have such a talented and loving couple provide demos to keep us on the right track. They were very knowledgeable and experienced and their final product left us in awe. I want to especially thank Genya for keeping myself (the bride) calm and collected during a very chaotic morning before the ceremony. Genya never made us feel rushed and reminded me to enjoy the little moments! Thank you again for doing such an amazing job capturing our day! He have just got to see the first sneak peak of the work Erik & Genya did for our wedding, and I have to tell you they have done a perfect job capturing all the important moment of that special day. I am anxious to get to see the full amount of pictures they took and relive every moment. In that day and during all the event they managed to have different angles of all of the things that where going on and I’m sure we made the right decision when we choose to have them as our photographers in OUR DAY. It was the perfect day with the perfect company! I absolutely recommend Shenko Photography! They are really amazing artists and lovely persons to work with. Really professional, punctual, and also respectful! Geya + Erik Shenko photography is a husband & wife photo team that we came across through a recommendation from another photographer. They reside in Cancun, Mexico and I was so happy to have found them! Photography was the biggest part of our wedding, for us. We love contemporary photography, and photos that catch those raw moments that we probably miss. I looked on their website, and their portfolio was amazing! All I kept saying was “ohhhh” and “ahhh” at almost every picture. 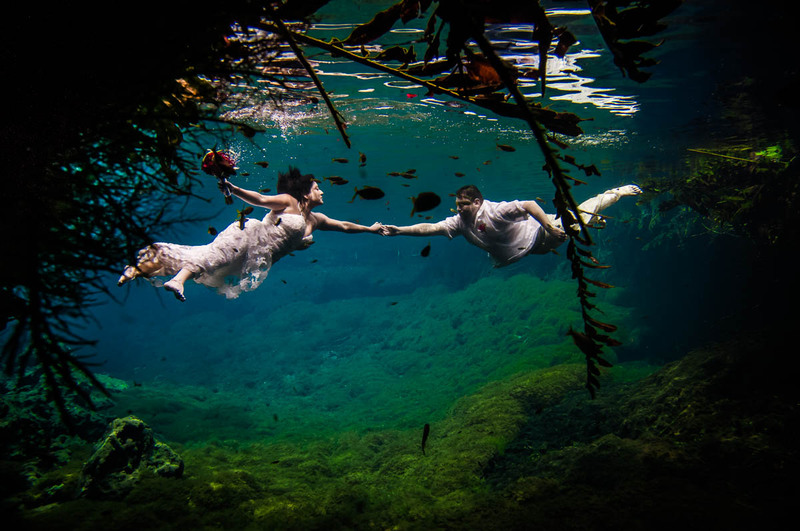 I also loved that they shot underwater “trash the dress” photos! 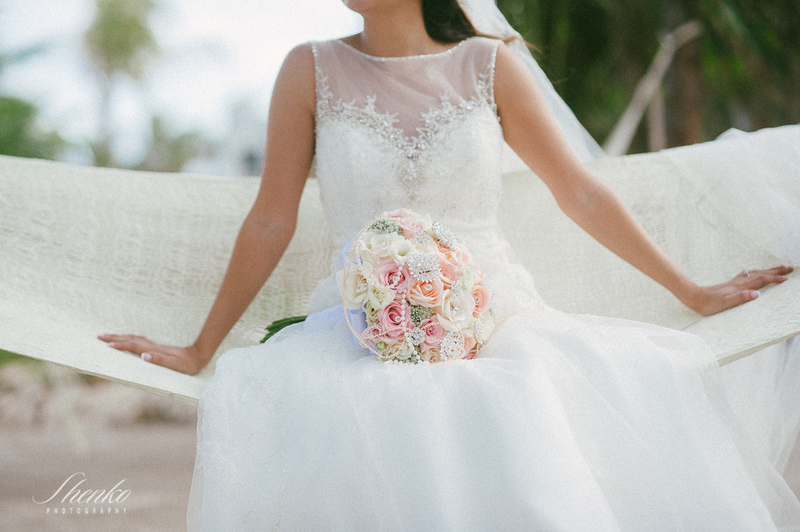 The communication with Genya & Erik was smooth since day one, and their packages and prices were extremely reasonable – way better value for the price than most other vendors in Cancun area. We met with them two days prior to the wedding and spoke briefly about what we wanted, other than what we’d sent them already through email. They were the perfect fit for us! They had a “stand back but get the shot’ approach, which is what we wanted. We didn’t want to spend a ton of time taking group shots and missing those impromptu moments that our guests had. The underwater shoot was so much fun! We went to a local cenote [freshwater pools that are famous for their underwater “caves”] and they led us every step of the way. It was very hard adjusting to the very cold water [yes, cold, in Mexico!] and learning how to “sink” ourselves. But, they were very patient and helped us to get the perfect shot! It was an experience we’ll always remember. We received our images through an online gallery within 1-2 months, and also received DVD’s in the mail. We were BLOWN AWAY by the shots they took, I am still in awe of them every time I look at them!!! 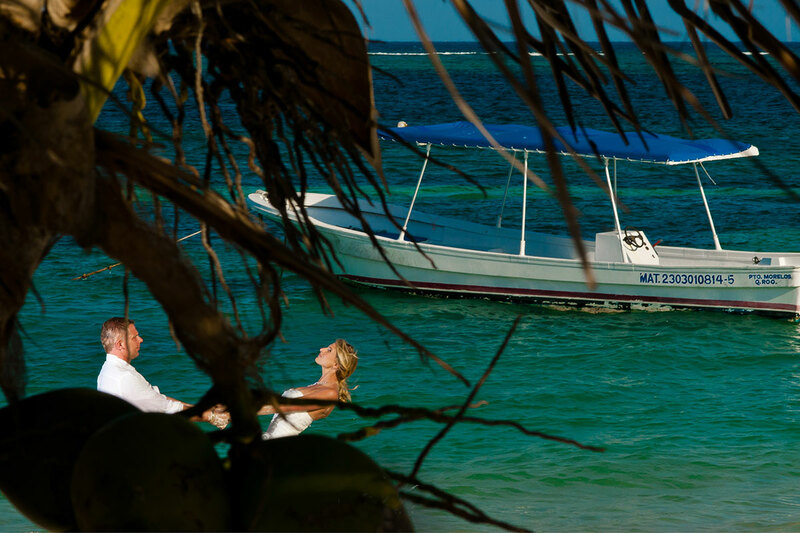 I would recommend Genya & Erik to anyone who is getting married in Cancun/Riviera Maya. They do travel all along the coast, as we got married in Puerto Morelos and the cenote was closer to Tulum. One of the best decisions we made was to hire Genya and Eric to document our wedding. 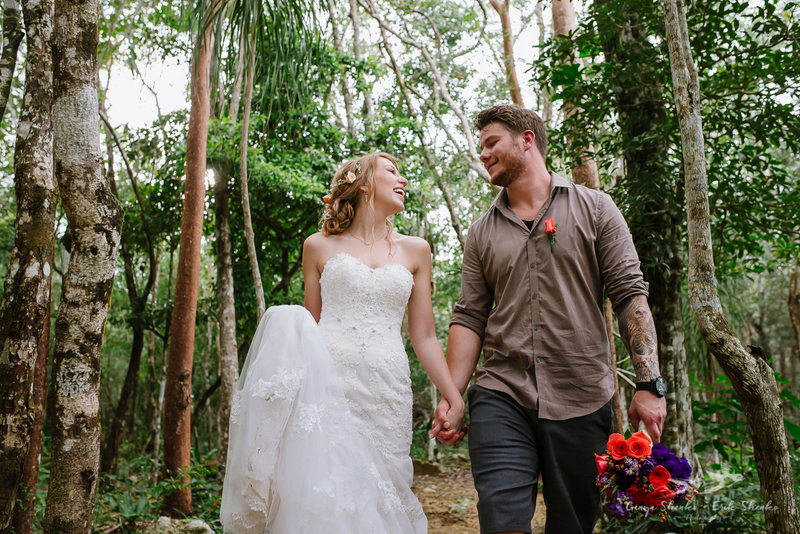 Photography was extremely important for me, and I had fallen in love with Shenko style while searching through numerous destination wedding photographers. They truly captured the moments and feelings of our wedding…it is artistry at its finest. Our family and friend were impressed by the photography, to say the least. In short, we cannot say enough about Genya and Eric. They are total professionals, their work is stunning and they are wonderful people. We are very happy to have crossed paths and couldn’t recommend them enough! In fact, we already did!! Thanks a million for a wonderful experience all around!! Erik & Genya are AMAZING!!! They captured our wedding day to the T and they went above and beyond to make our special day completely captured. So professional and generous with their time and talent, I feel so blessed to have had them be our wedding photographers. They are the sweetest couple and so patient and giving and we definitely plan on using them again. I cannot say enough on how wonderful they are and what wonderful photographers they both are. And how they also captured our Trash the Dress session. The photos came out amazing!!! Especially, since I had such a hard time sinking down into the cenote, Erik somehow made me look like it was a piece of cake! Truly magical moments! I still have people asking me how they were able to do it and complimenting me on how beautiful those pictures came out. Erik & Genya truly are the best. Honest, professional, personable and kind. I can’t recommend them enough. Thank you, again, for all that you both have done for us!!!! We truly enjoyed working with Erik and Genya on last May 2013 for our honey moon photos in Cancun. I’ve heard many stories from my friends how stressful it was to have wedding photography. However, we absolutely enjoyed every moment with this beautiful, genuine and creative couple. All the process of photo shooting was spontaneous, natural and cheerful. Since they are a married couple, the instructions for pose felt genuine. When I had an idea, they didn’t miss it and turned that into nice photo works. I would highly recommend Shenko Photography to anyone who wants “ADD” one more pleasure of your beautiful time of life. Nous sommes passés par Genya & Eric lors de notre mariage au Mexique en avril 2013. Ils sont non seulement très sympathiques, mais font en plus un travail remarquable. Nous avons fait une petite session photos lors de la cérémonie sur plage et, deux jours plus tard, nous avons fait une session “Trash the dress” dans un petit village de pêcheurs. Le résultat vaut vraiment la peine d’être vu! Notre mariage de rêve restera à tout jamais gravé dans nos cœurs, mais grâce à vous, il nous reste des images magnifiques qu’on ne se lasse pas de regarder encore et encore! Merci encore à vous deux pour ce beau travail!